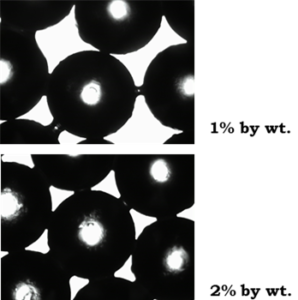 The composition of a particle and its evolution over time have an impact on its transport, its storage and its implementation. An optimization of those processes which involve complex particles, requires the quantification of the physical-chemical, structural and mechanical properties of powders, together with their evolution throughout the production chain. In order to reach this optimization, the consortium can count on a rich combination of expertise, of experiences, and ability to develop instruments and suitable experimental techniques, thanks to its academic partners. The project’s consortium developed some skills in order to produce particles with controlled mechanical properties (functionalised particles) which will be used during the project’s life. The consortium takes advantage of its experimental techniques in order to measure some particle properties; these measurements are fundamental for understanding how particles evolve and how they influence their flowability properties during their transport and implementation process. These measurements are carried out in collaboration with the laboratories of partners’ universities, according to their specific skills. The consortium is then carrying out a comprehensive study on the physical-chemical and mechanical properties of powder particles with an industrial relevance. 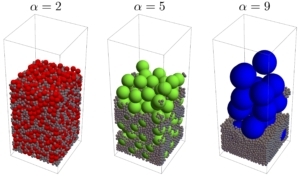 These measurements are necessary to develop physical models for numerical simulations (action 7) in order to adopt efficient numerical tools which may foresee the flowability behaviour of powders in complex situations, as those which may be found in industrial plants. The Institute for Mechanical and Process Engineering of the University of Kaiserslautern deals with several scientific topics which fall under the domain of particles technology. The researches of the department approach fundamental themes of mechanical and process engineering, from the generation and formulation of particles to define the properties of some dispersed substances to the separation of the particles dispersed in a gas or liquid phase. In order to characterize these dispersed particles, the department develops its own solutions of sensor technology, which are not just used on a laboratory scale. In the field of solids process technology, numerical and experimental simulations are essential to observe the macroscopic effects of bulk materials when they are stocked and to consider the micromechanics of particles when they interact among them or when they separate. At the core of any research activity lies the creation of individual simulation situations, among which the modelisation of multiphasic disposal plays a central role. In the framework of PowderReg project, the problems related to powders storage are examined in order to avoid fluctuations in mass flows and problems concerning disposal. 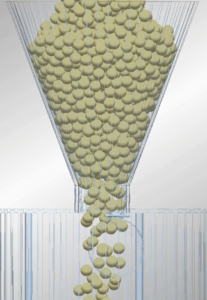 Besides experimental research, numerical methods (such as Discrete Element Method & Computational Fluid Dynamics) are used in order to simulate silo discharge and shear processes, for which micromechanical interactions are modelled and calibrated.